KIRKLAND, WA -- (MARKET WIRE) -- October 11, 2005 -- HomePages™, the first national home buying and selling service to combine aerial maps, in-depth neighborhood information, and nationwide home listings in one integrated Web site, launched today at www.homepages.com. Free to consumers, HomePages puts aerial mapping technology to practical use by combining aerial views of neighborhoods, homes for sale, and recently sold homes with millions of data points on local communities. HomePages enables consumers to identify the neighborhood that best meets their lifestyle, find the homes that are right for them, and view those homes relative to local services, including schools, restaurants and cafes, libraries, movie theaters, health care services, and more. HomePages helps consumers visualize the entire neighborhood so they can make the best decision when buying or selling a home. "HomePages is the first site to combine dynamic aerial mapping with comprehensive home listings and other local information on a nationwide basis," said Greg Sterling, program director with The Kelsey Group, a leading provider of strategic research and analysis. "It represents a next-generation product that more fully realizes the potential of mapping and local search in a single consumer destination." HomePages provides consumers with a complete visual picture of homes and neighborhoods with more than 500,000 square miles of high-resolution imagery covering 92 percent of the nation's metropolitan areas. Unique features such as real-time pan and zoom capabilities, the ability to save favorite homes and points of interest, and the "Send to a Friend" feature make it easy to navigate and share favorites with others. To find their ideal home, HomePages provides consumers with free access to nationwide home listings and provides the most comprehensive picture of the home and immediate surroundings available anywhere. Listings are updated twice daily in many markets, and consumers can choose to receive instant email updates whenever new homes hit the market, see recently sold homes in their neighborhood, and even find the value of their current home. HomePages also enables consumers to find rates on mortgages, get moving quotes, check credit scores, and receive tips on how to buy or sell a home. 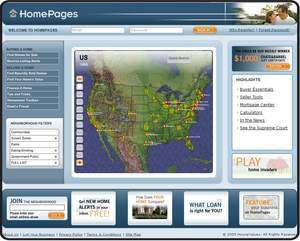 "HomePages.com is the first national home buying and selling site to bring together neighborhood information, nationwide home listings, and aerial maps to create one highly visual real estate experience," said Ian Morris, CEO of HouseValues, the company that developed HomePages. Morris added that HomePages combines aerial maps with nationwide home listings and recently sold home data, detailed school information, and millions of data points on local services and businesses to help consumers visualize every aspect of their homes and surrounding communities. According to Kelton Research, three out of four Americans (72 percent) believe that the neighborhood is more important than the house itself, and 73 percent would even give up their dream home to live in their ideal neighborhood. Additionally, 92 percent stated that being able to search for and compare homes and neighborhoods on the same site would save them a lot of time. HomePages is free to consumers and does not require any software installation, download, or registration. The site is available today at www.homepages.com. Founded in 1999, HouseValues Inc. (NASDAQ: SOLD) provides consumers and real estate professionals with the information and tools they need for success throughout the home buying and selling process. The company's flagship consumer products include HomePages.com™, a lifestyle and neighborhood-centric home buying and selling service; HouseValues.com®, a service that provides home sellers with market valuations of their current home; and JustListed.com™, a service that alerts home buyers as soon as new homes hit the market that meet their criteria.